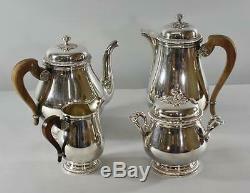 Christolfe silverplate coffee pot / tea set in Gallia pattern circa 1940's. Very good condition with slight surface wear. Coffee pot is 9 3/8 tall. Tea pot is 8 tall. Sugar pot is 6 tall. Creamer is 4 1/2 tall. Please give us a call with any questions. If you want to keep the item and have it repaired, an estimate of repair cost will be required. Please keep all packaging until any damage inspection is complete. The claim process may take upwards of 8 weeks to complete. Please be patient and we will keep you informed of the progress. The item "Christofle Silverplate Coffee Pot / Tea Set Gallia Circa 1940's" is in sale since Saturday, August 26, 2017. This item is in the category "Antiques\Silver\Silverplate\Tea/Coffee Pots & Sets". The seller is "lefflersantiques" and is located in Toledo, Ohio. This item can be shipped worldwide.